dc2tog. Leaving last loop of each dc on hook, work 2dc in next ch1 space, yrh pull through all loops. Worked in one piece starting from yoke. Row 2 to 9 – (Inc Row) ch3, * 1dc in each dc to 3dc group, 1dc in next dc, 3dc in centre dc on 3dc group, * rpt from * to * to last 3dc group, 1dc in next dc, 3dc in centre dc on 3dc group, 1dc in each dc to end, 1dc in top of ch3. You should have 126dc + ch3 at the end of Row 9. Fasten off. Turn. Row 13 – ch1, 1sc in base of ch1, * dc2tog in next ch1 space, 1sc in next sc, * rpt from * to * to last ch1 space, work dc2tog in ch1 space, sl st to first sc on beginning of row. Turn. Rpt Rows 12 & 13 until eight dc2tog rows have been worked from yoke or work measures approx 9 inches from shoulder. Fasten off. Turn. Rib – ch1, 1sc in base, 1sc in each st to end, sl st to first sc on beginning of row. Turn. Next Row – ch3, * fpdc around next dc, bpdc around next dc, * rpt from * to * to end, sl st to top of ch3 on beginning of row. Turn. Next Row – ch1, 1sc in base, 1sc in each dc to end, sl st to first sc on beginning of row. Fasten off. 3rd Row – ch1, 1sc in base of ch1, * ch1, skip dc2tog, 1sc in next sc, * rpt from * to * last dc2tog, ch1, skip dc2tog, sl st to first sc on beginning of row. Turn. 4th Row – ch1, 1sc in base of ch1, * dc2tog in next ch1 space, 1sc in next sc, * rpt from * to * to last ch1 space, dc2tog in ch1 space, sl st to first sc on beginning of row. Turn. Rpt 3rd & 4th Rows until eight dc2tog rows have been worked in all from yoke or underarm sleeve seam measures approx 4.5 inches. Turn. Fasten off. Neck Edge & Button Band – With RS facing join color 2 with a sl st to lower front edge on right hand side of opening, ch1, 1sc in base of ch1, work 18sc evenly in row ends up to neck edge, 3sc in corner, 1sc in each ch along starting ch edge, 3sc in corner, work 18sc evenly in row ends down left hand side of neck opening to end. Turn. Next Row – ch1, 1sc in base of ch1, 1sc in each sc to neck edge. Turn. Starting with ch1, 1sc in base of ch1, work one more row of 1sc in each sc to end. Fasten off. Next Row – ch1, 1sc in base of ch1, work 1sc in each sc and ch2 space to end. Turn. Row Four – ch1, 1sc in base of ch1, * dc2tog in next ch1 space, 1sc in next sc, * rpt from * to * to end. Turn. Rpt Rows Three & Four until 11 dc2tog Rows have been worked in all from beginning or work measures approx 6 inches. Fasten off. Join in color 1, rpt Rows Three & Four once. Fasten off. Turn. Join in color 2, rpt Rows Three & Four once. Fasten off. Finishing – Fold hood in half and over sew or slip stitch cast on edge together, with RS facing and color 2 work 54sc evenly along neck edge. Fasten off. Turn. Attach Hood to Sweater – Skipping button/buttonhole bands on either side of neck opening, slip stitch or over sew through row of sc on neck edge on sweater and front loop of sc along neck edge on hood. Fasten off. Weave in and trim off all loose ends of yarn, sew buttons on to correspond with buttonholes. 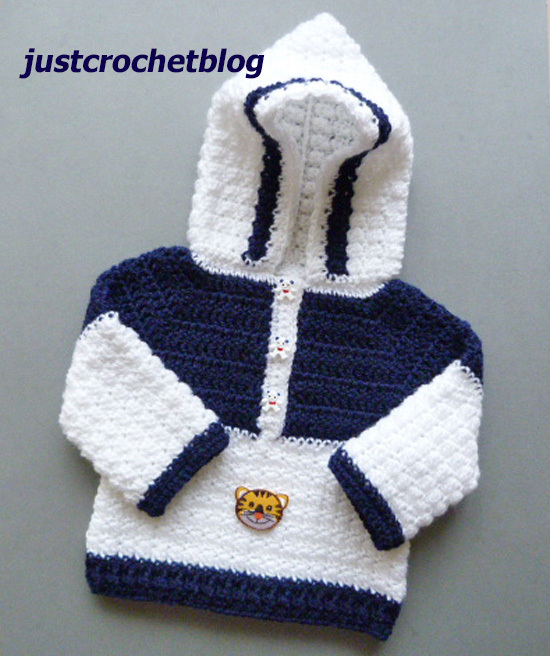 Hope you enjoy this free crochet hooded sweater baby pattern, don’t forget to pin!